In the early martyrologies, three different St. Valentines are mentioned, all sharing Feb. 14 for a feast day. A Roman Priest during the reign of Emperor Claudias II who persecuted the church at that particular time," an edict prohibited the marriage of young people. This was based on the hypothesis that unmarried soldiers fought better than married soldiers because married soldiers might be afraid of what might happen to them or their wives or families if they died." Valentine was caught, imprisoned and tortured for performing marriage ceremonies against command of Emperor Claudius II. "One of the men who was to judge him in line with the Roman law at the time was a man called Asterius, whose daughter, Julia, was blind. Valentine gave Julia lessons because she needed someone to read material for her to learn it. Valentine then became friends with Julia through his work with her when she came to visit him in jail. Emperor Claudius came to like Valentine, too, so he offered to pardon Valentine and set him free if Valentine would renounce his Christian faith and agree to worship the Roman gods. Not only did Valentine refuse to leave his faith, he also encouraged Emperor Claudius to place his trust in Christ. Valentine’s faithful choices cost him his life. Emperor Claudius was so enraged at Valentine’s response that he sentenced Valentine to die. Valentine prayed with and healedJulia,and Asterius himself became Christian as a result. Valentine used his time in jail to continue to reach out to people with the love that he said Jesus Christ gave him for others. Before he was killed, Valentine wrote a last note to encourage Julia to stay close to Jesus and to thank her for being his friend. He signed the note: “From your Valentine.” That note inspired people to begin writing their own loving messages to people on Valentine’s Feast Day. In the year 269 AD, Valentine was sentenced to a three part execution of a beating, stoning, and finally decapitation all because of his stand for Christian marriage. The story goes that the last words he wrote were in a note to Asterius' daughter. He inspired today's romantic missives by signing it, "from your Valentine." Eventually, St. Valentine was also arrested, condemned to death for his faith, beaten with clubs, and finally beheaded on Feb. 14, AD 270. He was buried on the Flaminian Way. Later, Pope Julius I (333-356) built a basilica at the site which preserved St. Valentine's tomb. Archeological digs in the 1500s and 1800s have found evidence of the tomb of St. Valentine. However, in the thirteenth century, his relics were transferred to the Church of Saint Praxedes near the Basilica of St. Mary Major, where they remain today. Also, a small church was built near the Flaminian Gate of Rome which is now known as the Porta del Popolo but was called in the 12th century "the Gate of St. Valentine," as noted by the early British historian William Somerset (also known as William of Malmesbury, d. 1143), who ranks after St. Bede in authority. The popular customs of showing love and affection on St. Valentine's Day is almost a coincidence with the feast day of the saint: During the Medieval Age, a common belief in England and France was that birds began to pair on Feb.14, "half-way through the second month of the year." Chaucer wrote in his "Parliament of Foules" (in Old English): "For this was on Seynt Valentyne's day, When every foul cometh ther to choose his mate." For this reason, the day was dedicated to "lovers" and prompted the sending of letters, gifts, or other signs of affection. Another literary example of St. Valentine's Day remembrances is found in Dame Elizabeth Brews "Paston Letters" (1477), where she writes to the suitor, John Paston, of her daughter, Margery: "And, cousin mine, upon Monday is St. Valentine's day and every bird chooseth himself a mate, and if it like you to come on Thursday night, and make provision that you may abide till then, I trust to God that ye shall speak to my husband and I shall pray that we may bring the matter to a conclusion." In turn, Margery wrote to John: "Unto my right well beloved Valentine John Paston, Squyer, be this bill delivered. Right reverend and worshipful and my right well beloved Valentine, I recommend me unto you, full heartily desiring to hear of your welfare, which I beseech Almighty God long for to preserve until His pleasure and your heart's desire." While speaking of the amorous flavour of Valentine's Day, no mention is made of the saint. The love of our Lord, depicted beautifully in the image of His most Sacred Heart, is a sacrificial, self-less, and unconditional love. Such is the love that each Christian is called to express in his own life, for God and neighbour. 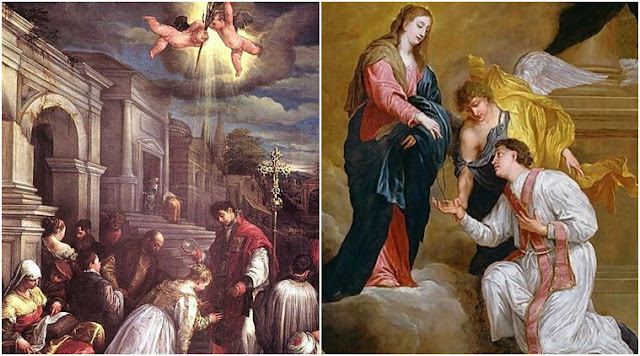 Clearly, St. Valentine-no matter which one-showed such a love, bearing witness to the faith in his dedication as a priest and in the offering of his own life in martyrdom. On this Valentine's day, looking to the example of this great saint, each person should offer again his love to the Lord, for only by doing so can he properly love those who are entrusted to his care and any other neighbour. Each person should again pledge his love to those loved ones, praying for their intentions, promising fidelity to them, and thanking them for their love in return. Never forget Jesus said, "This is my commandment: love one another as I have loved you. There is no greater love than this: to lay down one's life for one's friends" (Jn 15:12-13). St. Valentine fulfilled this command, and may we do the same.